When we arrived in Santorini it was the usual hectic port with people yelling for buses, cabs, rental cars, hotels, and tours. 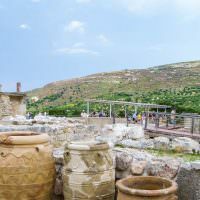 We ignored most of them and got on the bus to the capital, where we shared a jam-packed cab to Perissa where our hotel was. 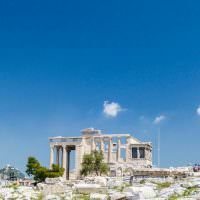 We had booked our apartment at Sandy Villas from booking.com and when we arrived we were again amazed by the quality of rooms in Greece. The first room we were shown was nicer than most we’ve stayed in, but experience tells us to always ask to see another room. EVERY hotel shows the worst room first to try to save the best for picky customers. The friendly manager, Sandy, was already treating us like family and was happy to give us what we believe was the best room in the complex. A 2 level condo with a beautiful view of the massive pool and the towering rocky cliffs as a backdrop. 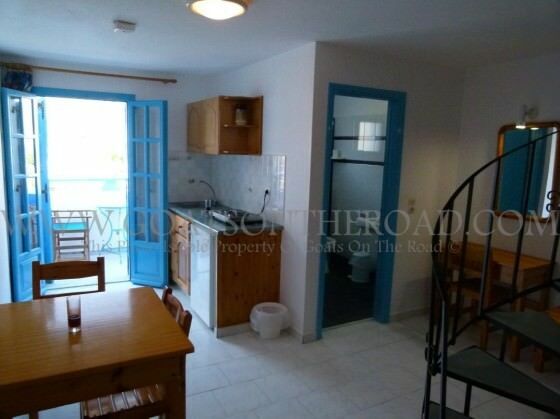 For $23/night it was easily the best value for money accommodation we have ever seen. Complete with a kitchen, balcony, dining area, and queen size bed we were in heaven. It’s a good thing we planned to stay 8 nights here. Nick enjoying the sun in the massive pool! Perissa, Santorini, Greece. View of the pool and the mountains from our patio. Perissa, Satorini, Greece. 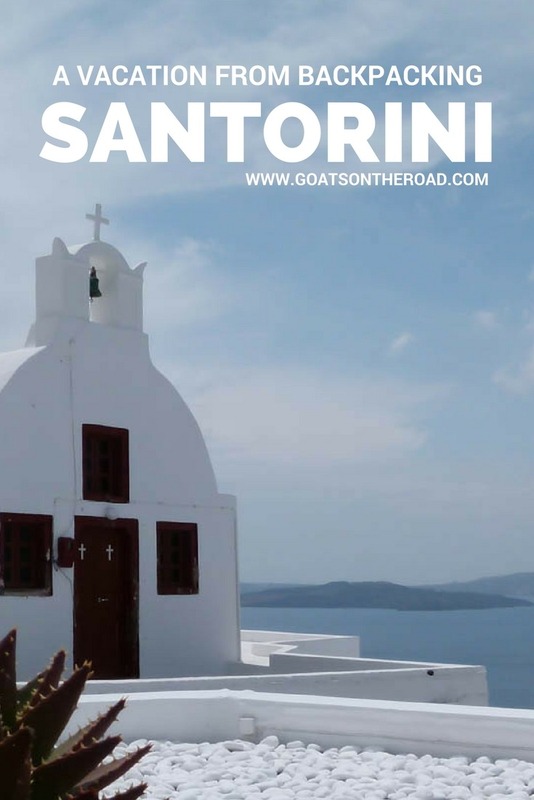 Santorini is a small, rocky island famous for its sunsets, wineries, and white washed buildings with blue domed roofs. We rented a little scooter for the entire time there and indulged in all the island had to offer. 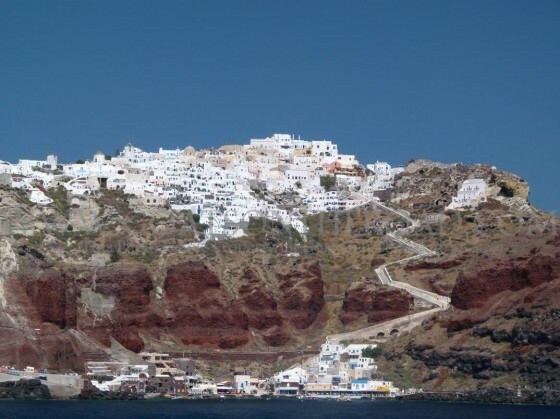 We visited the small town of Oia, where the white and blue stone structures sprawl their way down the cliff-side down to the sea. We watched the sunset numerous times and, although not the best we’ve seen in our travels, they were breathtaking. Night after night we would take our scooter up to a different secluded cliff and watched the purple, orange, and yellow clouds illuminate the sky as the sun sunk into the ocean. We set up a little seat with a bottle of wine and some snacks and talked until it got cold when the sun was gone. 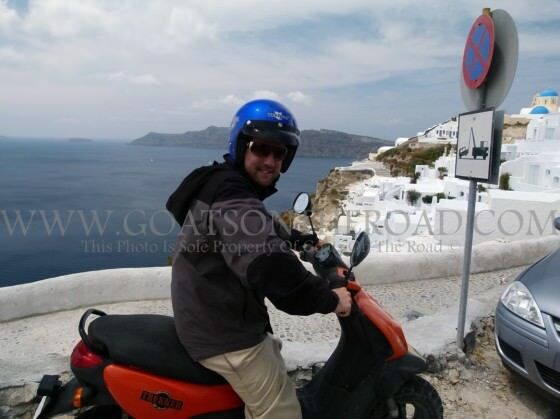 Scooting around Santorini Island, Greece. Enjoying some wine and a perfect sunset. Santorini, Greece. Other days we did a wine tasting and visited the aptly named Red Beach which is set below towering red rock cliffs and covered with red sand. We also went to a volcanic black sand beach close to our hotel, and relaxed by the pool for hours on end. This is our vacation from backpacking and we were completely relaxed the entire time. 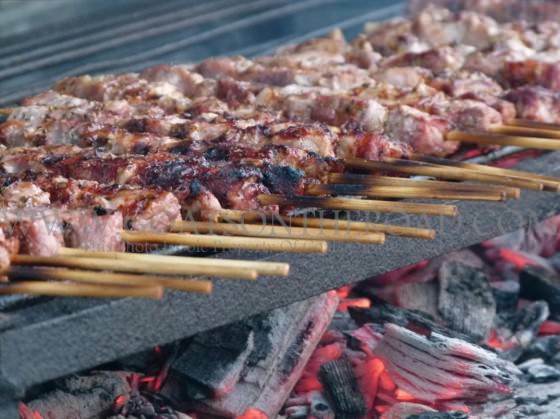 One night Sandy put on a huge barbecue with chicken and pork skewers, Greek salad, vine leaf wraps stuffed with rice and spices, tzatziki, bread, wine and a lot of other Greek delights that I don’t know the name for. It was really tasty and she even gave Dariece and I a half-price deal. Don’t expect half-price off all your food but she is very accommodating to budget backpackers. Sandy and her family are very kind, generous and fair business people. We got along really well with them. 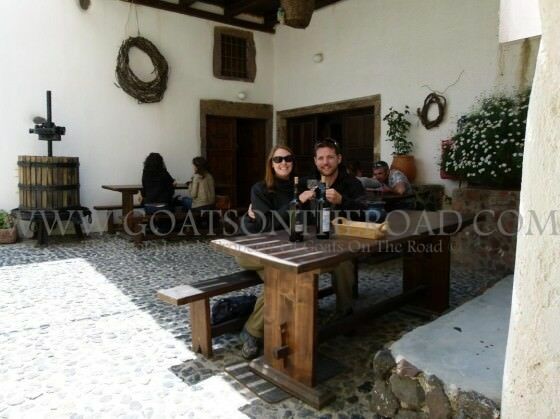 Enjoying some wine at the Gavalas Vineyard on Santorini Island, Greece. 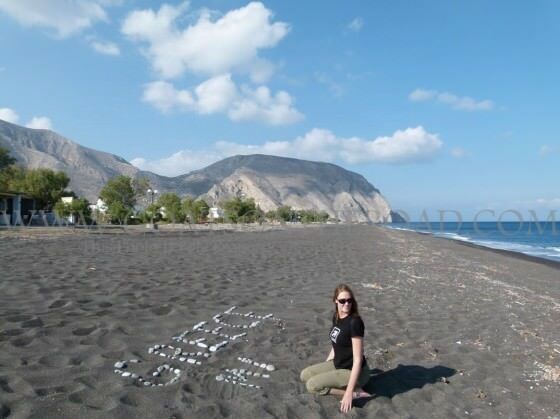 Black sand beach at Perissa, Santorini Island, Greece. 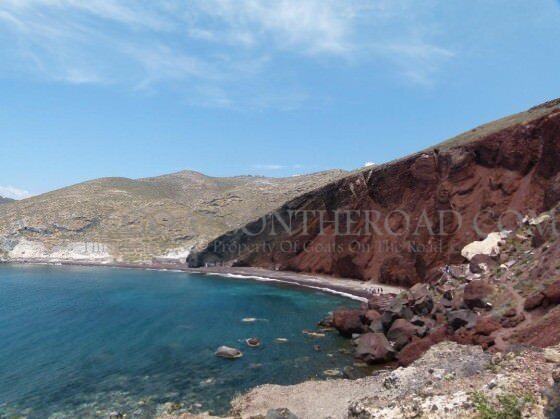 Beautiful Red Beach on Santorini Island, Greece. mmm, BBQ lamb skewers for dinner at Sandy Villas. Santorini Island, Greece. After spending more than a few nights in any place, we begin to fall into a comfortable routine and any place, no matter how far from home, begins to feel like home. Making our own food, drinking wine when we wanted, lazing by a pool, and watching the sun dip into the Mediterranean every night is an easy routine to fall into. So saying good-bye to Santorini wasn’t easy. It’s a little like having to go to work when we leave a place we love. The night before leaving, the sad thought of waking up early and departing on buses and boats, or trains and planes lingers in the backs of our minds. But as soon as the backpacks are hoisted on our backs and we’re on the comfortable leg of the journey, the thought vanishes and is replaced by the reborn excitement for a new adventure. And so it goes in travel, with each place a new adventure is born, and when we leave that place, the adventure never dies, it just stays in our memories waiting for the possibility that one day we may return to some of these beautiful paradises and relive the wonder of it somewhere again down the winding road of our travelling lives. Awesome pics! I was in Santorini a year ago and it definitely is one of the most beautiful places on this planet (that I’ve seen). Nice! We loved Santorini, it’s awesome. Such a beautiful place, so laid back too!